Let me take you on a personal journey through inspirational art that I love, and as part of that journey, you will learn a bit about my spiritual side. I come from a family of artists, in fact, I thought that one day I would be one myself, but instead the talent has moved down a generation to my son and outward to a sister, cousins, Aunt and Uncle. I do love art, and find either beauty in pictures, or meaning in pictures, depending upon the subject matter. My family was what some would call religious. We went to church each Sunday, and back when I was young, there were Wednesday night prayer meetings as well. Sunday nights there was more singing than the morning church service, I love singing. We could pick the songs we liked, and a woman would play the piano or organ while we all sang along. As I sit here in my living room, I can look up and see a small picture that hung at my grandparents house. I looked at it for all of my growing up years, and now that they have passed on to Heaven, it has become part of my home. It says "Prayer Changes Things" and is very old. It is a great reminder to me of my heritage and to pray, as it does indeed change things. I feel blessed to have come from a home where my parents, grandparents, great-grandparents, and on back through the generations, prayed for us. I listened from the other room when visiting my Grandparents. My Grandmother needed help with many things as she was a stroke victim, and my Grandfather took wonderful care of her and helped her as much as he could, including getting her settled in bed at night. There would often be a little fussing and small arguments, it makes me grin to remember that. 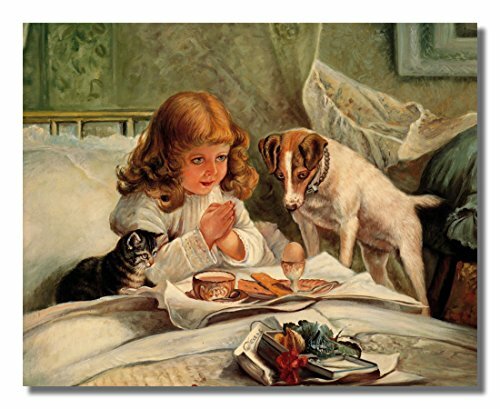 Then they would read from "Our Daily Bread", a devotional book, and the Bible, and pray together before retiring for the night. Were my parents and grandparents perfect? No, they failed many times as do we all, but they knew where to come when they realized they needed to make things right...directly to God in prayer, asking for and receiving forgiveness, then turning the opposite way and going in the right direction. 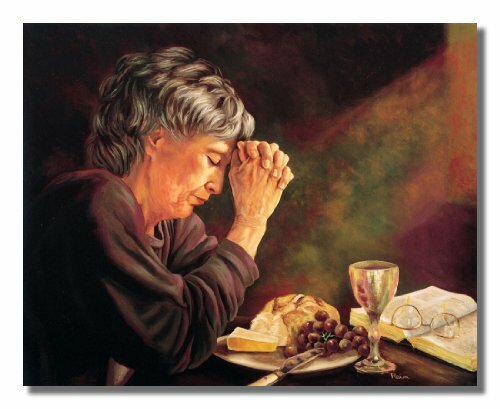 These beautiful art prints and pictures of a man and woman in prayer remind me of my praying parents and grandparents. My parents sent me to Sunday School as a girl. Early in my life, this was more motivated by my mother, it took my father more time to settle into his personal relationship with God through Jesus Christ after setting that aside while in the military. I actually learned about this recently when I told my Mom that I remember walking as a little girl among giants (adults) to and from Sunday School with one of them, but don't remember us sitting together in church at that time. That was to come later, and thankfully, not too much later. Sunday School laid a foundation for understanding the Bible. When you are young you hear the Bible stories from the Old Testament and the New Testament. They teach you from a young age about God, how He created the World and all that is in it, how much He loved all of His creation, how man is tempted to disobey God, and how He provided forgiveness. There are so very many, many stories, some of them happy, some sad, but all necessary to really understand as much as possible about this wonderful God who loves you and me. Suffer me to come to thee.."
..then we would say "God bless....." and prayed for all the members of the family we could think of or for any other concern that we had. I was known for going on and on, not missing a person in the family or a need that I knew someone had. Even as I type this I'm a bit teary eyed thinking of what a gift this was the my mother gave to me. 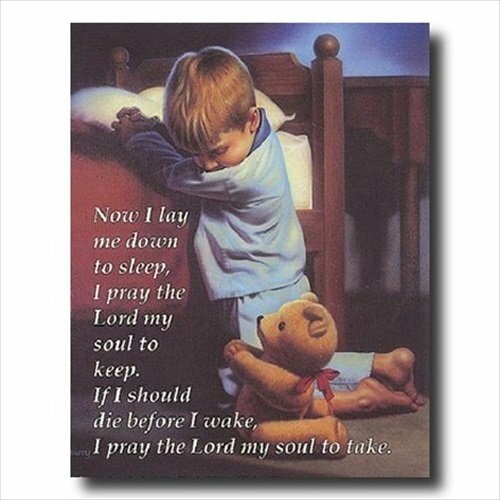 I prayed with my children when they were young, but I am not sure that I went in every single night and prayed with them. My mother still prays for each of us by name, and our children, and their husbands or wives. I never take that for granted and know it is why prayer is such an important part of life. It's not just a mechanical thing that I do, but actually sitting and talking to God just as if I were talking to you. 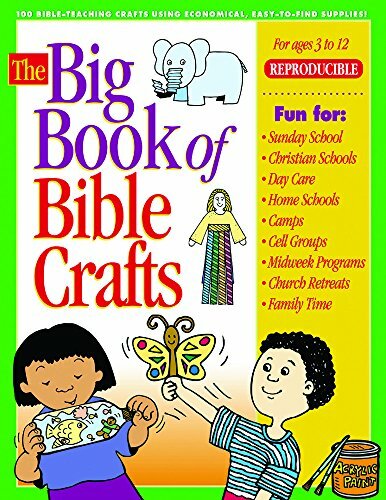 When I was a young girl, and had been going to Sunday School for a few years, my Mom decided to help with Vacation Bible School at the church we were attending at the time. Of course, any of us children who were around at that time, went along. I was the oldest, and was about 4, so either the brother born right after me was yet to come, or was a baby at the time, so was towed along either in my mom's "tummy" or arms. One day after we got home from Vacation Bible School, I wanted to know more about having a personal relationship with God. My mother explained how God is so holy and perfect He can't even look at sin...which meant even though He loved His creation, I could not come close to Him as a sinner...but wait...don't get upset...He loved me/us enough to remedy that. 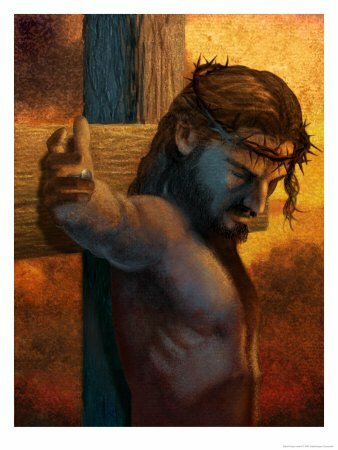 I learned the mystery of God coming to earth as the man Jesus to pay the ultimate price for the sins of those who believe in him. So much of this was mysterious to me, and still is, because God is God and I'm a person. His ways are not my ways...but they are just and right...He is the one who created everything, so who am I to question Him? Among the first Bible verses that I learned, and at that time it was in the King James Version with "thees", "thous" and "whosoevers", I learned "For God so loved the world, that He gave His only begotten son, that whosoever believeth in him should not perish, but have everlasting life. For God sent not His son into the world to condemn the world, but so that the world through him might be saved." John 3:16 and 17 Now I use a Bible that is translated from the original Hebrew and Greek that is written like you and I talk, the NIV version and the New American Standard version. They all are basically the same with the same message. 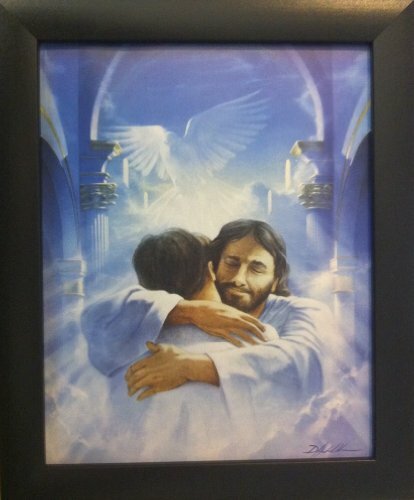 I look forward to the day when I can see Jesus with my own eyes, and we can give each other a real hug. When I walk through my home, every room has at least one inspirational piece of art or craft that helps me to keep my focus where it belongs. Let me tell you below exactly what I have in my home. 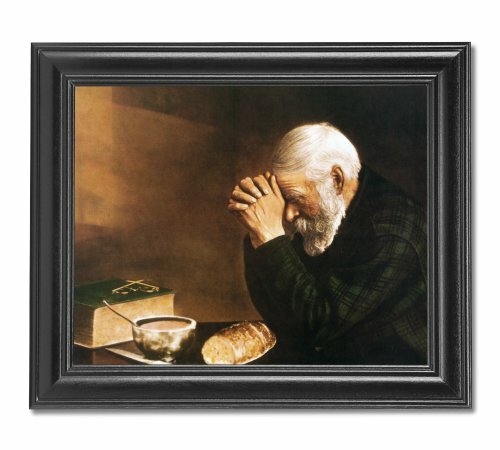 Living Room: A painting of a man looking small in a lighthouse with waves crashing all about, with the verse "The Lord is my Rock, my Fortress, and my Deliverer. My God is my Rock in Whom I take Refuge". Psalm 16:7 I am humbled as I type that...in the past few years we had Hurricane Irene come through and wow what a storm, the waters came at our home...we are okay, but it was frightening at the time. Then there was Hurricane Sandy, an even worse storm for many in my State. I prayed, but my mind was more fearful than it should have been..still, this verse has been a comfort and strength many times. 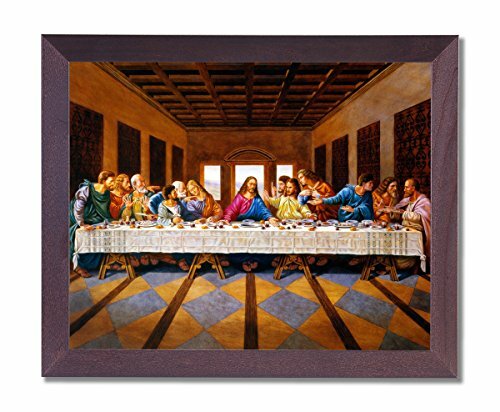 A plaque hangs in our living room that all see when they walk in that says "Lord, let there be love in our hearts, joy in our lives, and peace in our home". Do we accomplish that perfectly? Of course not, that is why I need reminders surrounding me. Finally, we have a needlework gift received from a friend when we married that has part of I Corinthians 13 on it, "Love bears all things, believes all things, hopes all things and endures all things." God tells us these things because he knows tough times will come and we need to be reminded. Bedroom: In our bedroom right next to my bed is the verse "Fear not, for I have redeemed thee" from Isaiah. When the fearful worrying thoughts that want to invade my peace come at night, this verse is a good reminder. Kitchen: In the kitchen, we have "Give us this day our Daily Bread" on a pewter decorative dish, and "My grace is sufficient for Thee", on a craft made at a retreat I went to...written on a very small chalkboard with a wooden candle holder glued to one of the side frames with a little candle in it, and ribbon to hang it. Bathroom: Even the bathroom has a small plaque that says "Prayer changes things", smaller than the one I described above. It also used to hang in my Grandparents home. I love it, and have kept it with me since childhood through many moves over the years. Yes, two of Thomas Kinkade's pictures hang in my living room. Though the artist has passed on, his work lives on to bring peace and joy. 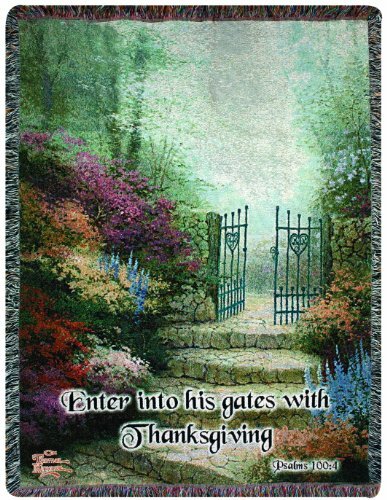 One of the items I have is a throw that was given to me as a gift from my mother. I decided to hang it instead, so bought a rod and brackets. It is "The Hidden Cottage" by Thomas Kinkade. The other was given to me by my daughter and hangs on the exposed logs over the fireplace in our log home. The picture is of a log cabin on a lake with a canoe in the water, very appropriate for our little lakefront cabin. 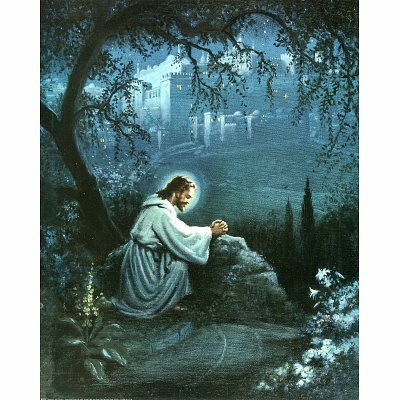 I love Thomas Kinkade's work, it brings such peace to look at it. 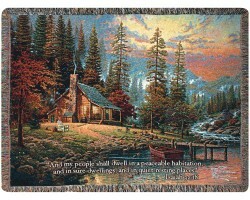 I have shared with you a few of many beautiful works of Christian art for the home that I have enjoyed. My journey is not finished, it continues each and every day. I may come back from time to time to share more bits and pieces of that journey with you. I hope you'll come back, and I hope you, too, are surrounded by beauty and inspirational art in your home. Do you have art that inspires you in your home? @NanciArvizu Thank you so much, I enjoyed sharing this way. Beautiful page, shared so well. Thank you for the story. @Dustytoes, I know the old english king james version of the verse...something like "The prayer of a righteous man availeth much" but can't think of the reference right now. But it is true:-) Thanks for sharing your thoughts...I am blessed and fortunate, you are right. Sometimes taking time to write about it reminds me of my blessings which are easy to take for granted. The prayers of the righteous are powerful and effective! That is the verse that comes to me when reading this, and don't know where the scripture is found off the top of my head, but you are very fortunate to have had loving people pray for you all your life. I do believe that it makes a huge difference. Lovely page! Very nice post, I hear daily Mom still praying for me, so I enjoy reading about your faith, believes, and values. this is a beautiful, heartfelt article! you are made stronger by your faith. Corinthians is one of my favorite books. I don't have any of these types of artwork, not because I dont approve, it just doesnt make me feel the way it does for you. But thats OK, we know where to go to find inspiration eh?